Your correspondent will go to all corners of the earth to uncover newsworthy morsels to pass on to the Nation as they pertain to the thoroughbred horse business. In his travels Topo encounters many creatures that are potential threats to his well-being but not to worry as you can see below Topo fears no feline. Let’s get down to the matter at hand. Regardless of the rhetoric of this being the final Canadian Derby to be run at Northlands, we are more than confident that at least #89 will take place at the Park next year. Maybe the marketing guys at Northlands are getting advice from their departed Manager, Chris Roberts who I’m sure promotes that there is upside in advertising it’s the last of anything since this surely will bring customers out in droves for the supposed finale. Assuming Topo’s memory is up to speed this is the final running of the Canadian Derby for the second straight year or is it three? But we digress. The 88th running of the Canadian Derby which is the marquee event of the Alberta racing calendar will be run as Race 11 this Saturday. Reliable sources report that Northlands put on a great event at the post-position draw on Wednesday for Media and connections of the entrants. Very positive reports on the food served even though there apparently was no cheese. There were however complaints directed to Topo wondering why neither libations nor wine was available. To ask a rhetorical question – who has a Media event without the appropriate refreshment which is what attracts media to an event in the first place? Under these circumstances Topo’s attendance would have been a nonstarter had he actually been invited. A slight negative on the race itself is that a relatively short field will go postward which is good for the participants but no so good for wagering. Since 2008 there has been one other occasion (2012) where only eight (8) horses went to the post unlike the others where 10-12 horses started each time. Topo is surprised that Real Quality trained by the veteran “Colonel” who basically got paid $30,000 for a workout in the Grande Prairie Derby when winning by the length of the stretch, was nominated for the race but did not enter. One can only speculate that something physical is currently amiss with the horse. Unfortunately we are in a quandary this time around insofar as selecting a horse for the loyalists to wager on. As the faithful in all probability know, Topo is partial to both trainer Robertino Diodoro (Zio) and Riversedge Racing Stable. Both of these operations consider Topo close family and appropriately all our business dealings are done under the family pricing model. Topo is so loyal to both groups that he will be relegated to the mouse hole (not doghouse) by whomever we offend in not selecting their charge. This situation is so perplexing that Topo does not even know the proper attire to don for the event! Topo’s torn. He’s stuck between una roccia e un posto duro. We have Riversedge’s Trooper John who has been installed as the 8/5 morning line favorite and Diodoro’s Chief Know It All next in line at 2/1. How can one fault Trooper John’s form?– a winner of 5 stake races in a row culminating with an almost ten length victory in the Count Lathum the prep for the Derby. This can only suggest he is on top of his game coming into this one and will be most difficult to topple. The male side of the Pedigree being by Colonel John who in turn was sired by back to back Breeders Cup Classic winner Tiznow suggests lots of stamina to get the 13/8 mile distance. Chief Know It All comes to Northlands with distinction – the partnership of Wiest/Rollingson/Howg claimed the horse for $100,000 (that’s US dollars) out of his last race at Churchill Downs which is the highest price horse claimed in the history of Churchill. 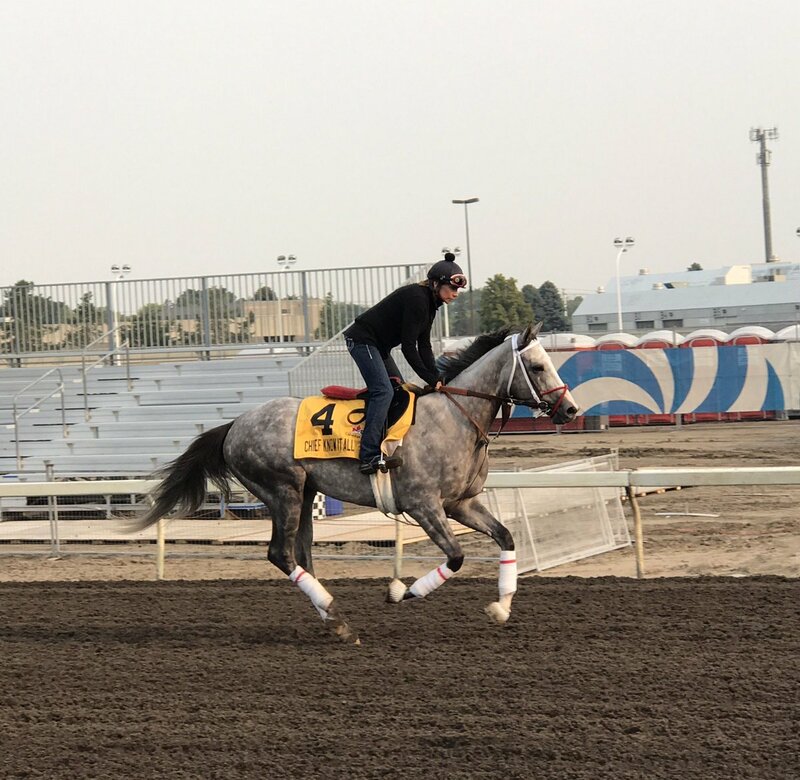 The grey Chief is sired by Flashy Bull who is now standing in Saudi Arabia and Topo’s keen eye notes that even though he won a G1 at 1 1/8 miles, the majority of his get are sprinters so he may be challenged getting the Derby distance. What’s interesting here is that Randy Howg was a partner in Broadway Empire and Edison winners of the 2013 and 2014 Derbies and came within two lengths of capturing the race last year with Inside Straight. It should be further noted that Riversedge won the 2015 Canadian Derby with the filly Academic in partnership with Bear Stable. Trainer Tim Rycroft and Riversedge are going for 2 with Diodoro and Randy going for 3 in the last five years. Should one of these groups achieve that result it will be an excellent addition to training resumes and owners’ bragging rights. Even though Topo is not fond of anything or all things political, the aforementioned circumstances forces us to focus on the third horse here as the one to upset the apple cart – #6 Aqua Frio. He is a son of the very hot sire Uncle Mo who currently stands at the Irish Lads’ Coolmore in Kentucky. for an advertised fee $150,000 if you can actually get your mare to him. Aqua comes to us from Emerald Downs and in the 1 1/8 Emerald Derby finished a closing second. Of the 208 starters that Uncle Mo has sired to date, it appears that only Kentucky Derby winner Nyquist has succeeded at 1 1/4 miles. Based on his running style we think that Aqua will get the distance but the overhanging question for Topo is having finished second to his stablemate Riser; why is Riser not here? In other words will the top Blaine Wright horse be competing at the Park? 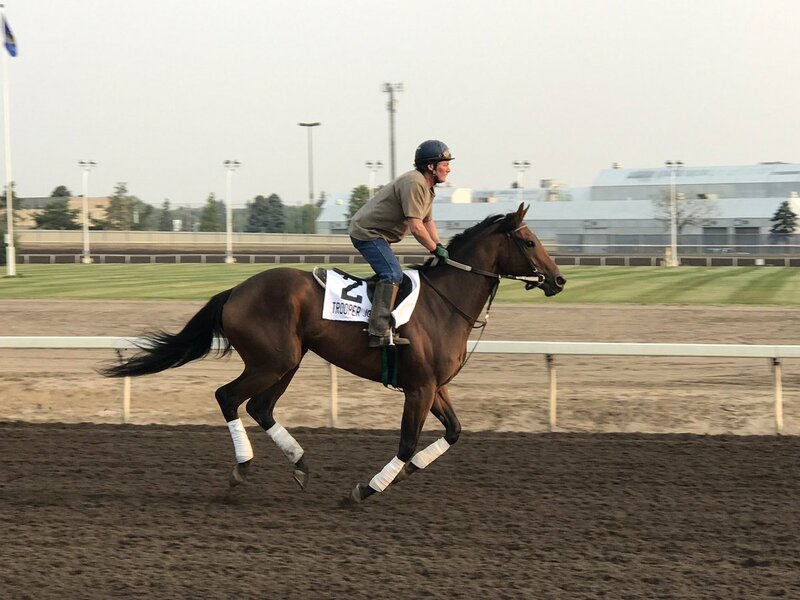 It should be further noted that both Chief Know It All and Aqua Frio are small in stature so there should be no issue negotiating the turns at Northlands – the track will beat neither one of these horses. Race goers will be rewarded with a fine show on Derby day with a total of four (4) additional stakes on the 12 race card. Large fields in the majority of races will provide great investment opportunities. If the weather cooperates there is no reason for a less than stellar turnout with lots of energy throughout the Park. The program should flow smoothly since there are no music concerts this go around. Arrogate seeks redemption in Sunday’s $1 million G1 Pacific Classic at Del Mar. Funny how questions regarding his ability are surfacing for a horse that has earned over $17 million in 9 lifetime starts. This is truly a sport which constantly asks “what have you done for me lately”. He definitely laid an egg in the San Diego when beaten 18 lengths by Accelerate who will now try to defeat him again but this time at equal weights. Topo figures the horse to fear most is Bob Baffert’s other entry Collected who previously defeated Accelerate by 16 lengths although neither horse are proven going 1 ¼ miles. This corner wants to see Arrogate win in here to set up what will be the race of the year contested in the Breeders’ Cup Classic. Everything being equal there will be little to choose between Gun Runner and Arrogate and the faithful know who Topo favors. Topo is looking forward to Race 6 at Saratoga on Saturday with the reappearance of the $1.3 million Uncle Mo yearling christened Monaco. So far he has been a bust on the race track and at the rate he is earning purse money he would need another 214 starts to recover his initial investment. After his last race, trainer Todd Pletcher had enough and was prepared to move the horse on. Robertino has purchased Pletcher’s castoffs in the past with success prompting client Randy Howg offering to purchase the horse and as a tribute to his name sake move him to Alberta. The deal did not materialize as another Italian Mike Repole purchased the Irish Lads’ interest and is now the sole proprietor. We shall see who made the smart move in this one. Interesting named foes in the race – Caviar Czar and Wine Not. Topo likes Caviar but who would name a horse Wine Not? We could have live Whine Not but the suggestion not to enjoy and/or drink wine does not sit well with Topo. Sal says that Riser may be in Blaine Wright’s barn but he’s owned by Chappell Alpine Farms LLC and not Peter Redekop. Sal says that if Aqua Frio wins Topo can celebrate with the boys from the Derby Bar & Grill and enjoy some vino bianco raffreddato e buon formaggio. Sal says that if Topo needed sartorial guidance Topo should have been at Talk Derby To Me last Saturday.